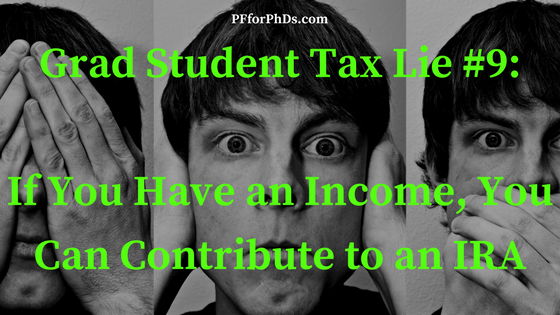 Grad Student Tax Lie #9: If you have an income, you can contribute to an IRA. This tax lie is tied with lie #6 as my least favorite because I fervently wish it were true. It makes intuitive sense that everyone with an income should have access to tax-advantaged retirement accounts. However, only income that is taxable compensation is eligible to be contributed to an individual retirement arrangement (IRA). Scholarships and fellowships paid to grad students are almost always reported on a 1098-T, a 1099-MISC (box 3), a courtesy letter, or not at all – basically anywhere other than a W-2. So the question of taxable compensation as it relates to grad student income comes down to whether the income was reported on a W-2 (which is typical for assistantships). Grad student pay that is reported on a W-2 is compensatory, while grad student pay reported on a 1098-T, a 1099-MISC (box 3), a courtesy letter, or not at all is non-compensatory. If your only source of income in a calendar year is non-compensatory fellowship pay, unfortunately you aren’t supposed to contribute to an IRA for that year. However, if you are married to someone with taxable compensation, you can contribute to a spousal IRA. If you are an unmarried fellowship recipient who really wants to contribute to an IRA, you can consider generating a side income specifically to gain that eligibility. You can contribute 100% of your taxable compensation to an IRA up to $5,500 in 2018. Further reading: Can a Grad Student Have a Side Income? Ineligibility to use an IRA, however, is not a reason to give up on your goal of saving for retirement while receiving fellowship income. There are workarounds available so that you can still minimize your tax burden.